Inauguration of Ste Joan Margaret Clinic. Join us on Saturday, February 25, 2012 for a day filled with festivities! The Ste. 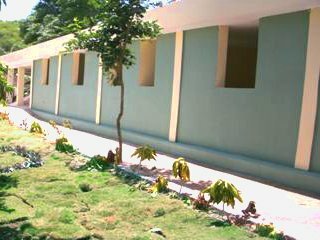 Joan Margaret Hospital Clinic is a center for health care situated at l'homond approximately 3.72 miles from Dugue. This center receives patients every Tuesday for general consultation. The space in the clinic is divided into several rooms, a waiting room, a dentist office, a pharmacy, a billing/cash office, archive filing room, three consultation rooms, a laboratory, an operating room, an extra room in reserve for a new consultation room or for a staff break room, a modern toilet, a space reserved for electonic equipment and two external toilets for patients. Furthermore, an additional pre-fabricated house is placed next to the clinic to house visiting doctors, guests, etc. This building contains three bedrooms, one bathroom, a waiting room, a dining room, and a lounge.